The 100 starts to explore the new threat brought on by the prisoners as those in space try to find a way to return to the surface. Clarke’s actions in this episode call back to the early days of season 1 in terms of how she forms a strategy. She uses one of them as bait and keeps them guessing with multiple attacks on them from different locations. 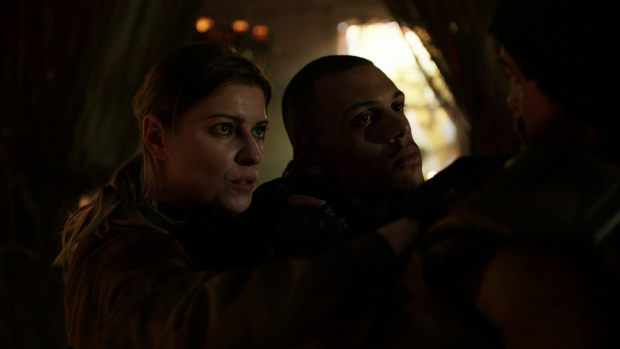 It has the desired effect as they assume they are dealing with multiple people rather than just one which shows just how intelligent and effective Clarke’s strategy is. Referencing Lincoln’s season 1 tactics is a nice touch that will mean more for those that can remember that far back because it shows something of a role reversal for Clarke. In season 1 she was the invader dealing with people who called Earth home and now she’s the Grounder looking to defend her way of life. This is something of a reward for the years of development we have seen from Clarke and the rest of the cast. 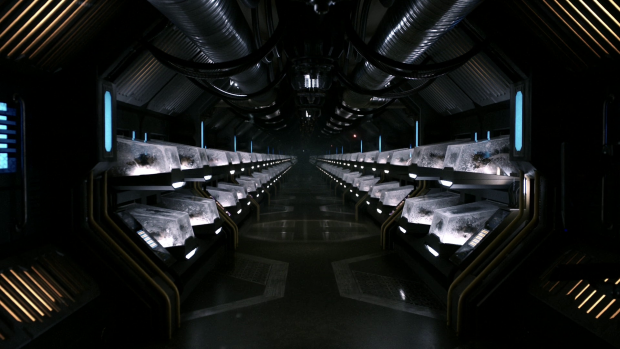 I mentioned in the first episode of the season that the prisoners are a darker version of the 100 teenagers sent to Earth’s surface to see if it might be liveable. This episode supports this by remarking that the situation seems familiar and referencing season 1 plot details as I’ve mentioned above. When Clarke is captured she remains silent in the hopes that the invaders will think she doesn’t speak English. This worked for days when Lincoln tried it but Charmaine Diyoza (Ivana Milicevic) is a lot smarter than they were at that point and quickly realises the deception because she observes Clarke looking at the walkie talkie every time it goes off and clearly understanding what is being said. Clarke’s brutal tactics early in the episode show how formidable a combatant she is which will already be known to those that watch the show. Reinforcing that is always useful because it allows a baseline to be established that the prisoners have to feed into. In terms of threat level they don’t seem all that significant as a group because it is only their numbers that gets the best of Clarke. This doesn’t mean that they’re a joke as far as antagonists go as the point of their appearance here is that Clarke knows the territory and they don’t. They are commanded like a military unit and have a really intelligent leader calling the shots to make them more effective. Charmaine Diyoza is an interesting character so far who serves as an effective foil for Clarke. She is constantly suspicious and picks up on various signs that point her towards certain conclusions. The language thing is one of them and the suggestion of compassion on Clarke’s end is another. It’s clear to her that Clarke is protecting people that she cares about so that becomes the basis for her negotiation. She lies to Clarke about the intentions of her people when she says that they don’t mean anyone any harm but there’s a nugget of truth in there when she tells Clarke they didn’t know anyone else was in the Valley. As expected Clarke reveals her ability to speak and understand English when Madi is put in danger. It has already been established that she cares deeply for this daughter she has adopted and will knowingly put herself in danger if it means protecting her. From here we start to get something of a relationship building between Charmaine and Clarke who fills her in on the end of the world and various other details. It’s a quick catch up for Charmaine on the major events leading to this particular moment but it also gives her an idea of everything Clarke has been through and confirms that she’s dealing with a formidable adversary. So far Charmaine seems reasonable despite her hardened exterior. She certainly seems open to hearing ideas that allow for everyone to stay alive which is certainly a good thing as it will allow for a more complex dynamic to evolve as the season progresses. She is certainly intimidating and clearly has the respect of her fellow prisoners. Keeping them in line may be one reason for her hardened attitude so it’s possible this might soften when she isn’t focused on commanding her people. Another prisoner the episode fixates on is Zeke (Jordan Bolger). He comes across as a very thoughtful person who tries a friendlier approach to finding out if Clarke speaks English by sharing stories of his life on Earth and sincerely pointing out that it’s the best conversation he’s had in a long time even if it is one sided. This adds a bit of nuance to the collection of prisoners by suggesting that not everyone is a dispassionate killing machine and that there might be a variety of characteristics in there. That isn’t to say that the majority of prisoners are in for shoplifting or other misdemeanours. Bellamy has a look through the prisoner manifest and sees that they have considerable rap sheets mostly containing murder. There may be depth and variety to this new population but the episode makes it clear that they are very dangerous people. 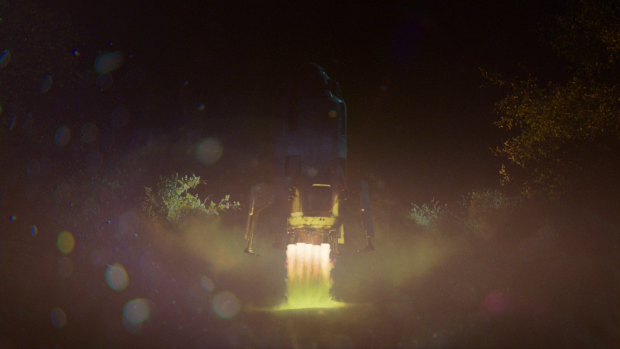 The scenes in space play out a little like a horror movie with the characters heading into unfamiliar territory with no idea what to expect. At first the ship is really uninviting with dark confined corridors and an ominous alarm signalling danger when they first alive. They are all apprehensive about their presence there which keeps the tension heightened as they and the audience wait for something to go wrong. When a prisoner does attack it feels like the situation is resolved a little too easily but the slow increase in tension works well. Their goal is to find fuel so that they can head back to the surface and that is certainly achieved but it does come at a cost to them. The discovery of cryo tubes containing 286 prisoners sets up a considerable threat to them that combines with the prisoners on the surface to create a very dangerous scenario. Tech genius Raven is able to manipulate the system so that the cryo tubes can be turned off and kill the prisoners which gives them leverage in a negotiation. Rigging a system so that nearly 300 people can be killed at a moments notice is a really brutal tactic that isn’t out of place on this show. People have justified some really horrific actions over the years out of belief that it’s necessary. Bellamy has clearly changed a great deal in the 6 years he has been in space as he isn’t keen to repeat past mistakes and he certainly doesn’t want to give an order that would result in that much death. It’s blood on his hands that he doesn’t want and he wouldn’t want Raven to shoulder that burden either so he is fully committed to finding another way. Considering his past exploits where he presided over a massacre at the instruction of someone else this makes for a notable step forward for him. It’s a clear example of someone learning from their mistakes and being burdened by the resulting guilt of the questionable things he knowingly went along with. 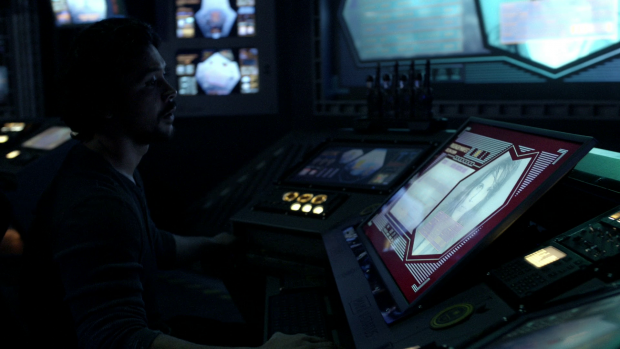 Bellamy also demonstrates leadership skills when he accepts that Raven has to stay to operate this contingency plan. Carrying it out is a very technical process that would take time they don’t have to train someone else in how to do it so the logical course of action is that Raven stays and waits for the signal. Bellamy isn’t prepared to give that order but Raven doesn’t take no for an answer and offers two potential avenues to get her to the surface. 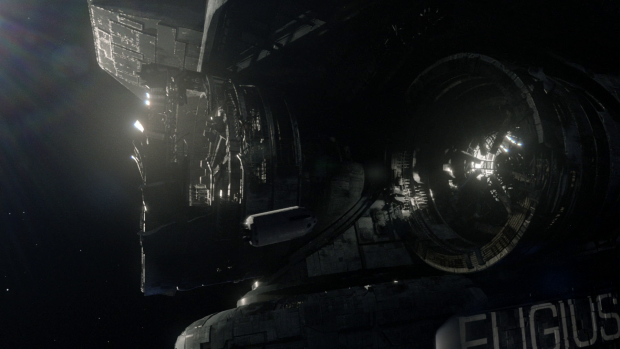 The first is hitching a ride with the prisoners once Bellamy negotiates a truce with them and the other is an escape pod. Raven is lying about the second option but Bellamy doesn’t know that and lets her stay because there is no other choice at that particular point in time. This clearly weighs heavily on him as evidenced by Bob Morley’s sorrowful performance when he explains the situation to everyone else. Murphy’s decision to stay is perfectly in keeping with his character. It has been established that he adopted an isolationist approach when living in space and only really interacts with the group when he has to. This is largely out of guilt and self loathing but there’s a suggestion that he wants some form of redemption as he does work with the others when the occasion calls for it and his decision to stay doesn’t seem to be entirely motivated by him being selfish. One possible reason for his decision is that he struggles to be around Emori. He is shown trying to be around her at any possible opportunity where she is barely able to tolerate him. 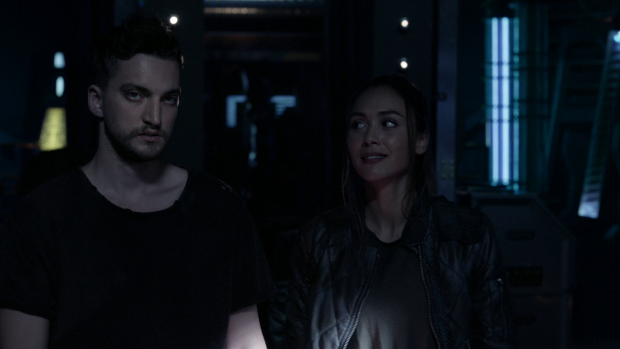 Both characters are deeply insecure about various thing and are projecting that onto each other creating a really uncomfortable situation compounded by the fact that Murphy clearly still has strong feelings for her. It’s possible that he decides to stay because being around her is too difficult for him. Another possible reason is simple guilt. He is the cause of Raven’s injury and feels the need to atone for that in some way by making sure that she has company rather than being left up in space alone. This sets up a really interesting scenario around these characters and offers the opportunity to see them forced to interact because there is nobody else around other than a collection of sleeping prisoners. There’s definitely a lot of chemistry to their interactions as well which may end up translating into something romantic though it could just result in a compelling friendship that blossoms under these conditions. Either way they are two fascinating characters who have plenty of opportunity to bounce off one another. Bellamy’s dynamic with Murphy also gets some attention in this episode. When it comes to making a decision about the prisoners Bellamy wants to know Murphy’s opinion which makes for another callback to season 1 when Murphy was Bellamy’s right hand man in the more naive days where Bellamy was more focused on being the dominant presence within a group of teenagers than being a reasonable and mature leader. Their dynamic is nowhere near the same and a lot has happened to sour their friendship but the fact that Bellamy is still interested in his opinion and makes a point of asking for it suggests that Bellamy still values him as a friend to some degree and recognises that Murphy is fundamentally a good person as evidenced by him getting the answer that he’s obviously looking for. The beauty of this show is that the relationships continue to grow more complex and the Bellamy/Murphy interactions are a great showcase for that. Emori’s development in the intervening years is one of the most interesting things at play here. She was a Grounder so being in space is a significant adjustment for her that she isn’t entirely comfortable with but she has risen to the challenge by throwing herself into learning new things and pushed herself out of her comfort zone. Her confidence is shaken somewhat by her failed attempt to dock the pod but when the time comes she proves that she has the skills necessarily and only needed the right motivation to rise to the occasion. In this case she needed Raven not to be there and for her to be responsible for the survival of everyone she has come to care about over the past few years. When faced with this she lands the pod as she has been trained to do and shows that all of her hard work has been worth it. Monty is similar to Emori in a lot of ways because he has embraced his time on the Ark as an opportunity to build a safe and comfortable life for himself. The surface represents constant challenge and danger where the ark represents safety for him. When confronted about his Algae farm he defends everything they have built as a group and points out that they are the safest they have ever been. I suspect that Monty will have the hardest time adjusting to life on the surface after being away for so long and feeling safe. An excellent episode that sets up the prisoners as complex antagonists for the rest of the season. Clarke’s tactics when fighting back against the invaders are an effective callback to the first season and solidify Clarke’s role reversal into becoming a Grounder where the prisoners represent a darker version of the 100 teenagers sent down to the planet in the first season. Charmaine makes for an interesting lead character for this faction. Her intelligence is quickly established when she observes that Clarke can most likely speak English but is hiding it to find out information about her opponents. She seems reasonable in the sense that she’s willing to listen to ideas that allow for everyone to survive and I get the impression that her hardened exterior is to keep the other prisoners in line but she will prove to be more complex than that. The scenes in space that started off like a horror movie were nicely done even if the payoff to the slow increase in tension wasn’t as effective as it could have been. I liked how uninviting the environment is and the reveal of the cryo tubes introduced a potential threat that maintained the urgency. The presence of the sleeping prisoners acted as an effective showcase of how much Bellamy has developed since last season. He isn’t interested in condemning anyone to death and making the same mistakes that were made before. It means a lot coming from him and shows his growth as a leader. Even Murphy proves himself to be a fundamentally good person by agreeing with this stance. Bellamy’s decision to let Raven stay behind also shows his leadership skills as he makes a very hard decision in the interests of making sure he has enough leverage to bargain with the prisoners. Raven and Murphy left together on the ship should make for some interesting interactions and ties nicely into Murphy’s guilt driven approach to the situation. Emori’s response to being in an uncomfortable situation is to throw herself fully into it by learning as much as she can. She has confidence issues but it turns out all she needs is the push brought on by Raven not being around to help. It’s an important step forward for her to realise that all of her training has paid off.